President Barack Obama made a statement from the White House on Monday evening shortly after Saint Louis County prosecutors announced a grand jury would not indict a Ferguson, Missouri police officer who shot an unarmed African-American teenager earlier this summer. In his remarks, which were announced just a few minutes before they occurred, Obama encouraged those who might protest the verdict to do so peacefully. He also acknowledged there are real “problems” and a “deep distrust” that exists “between law enforcement and people of colour” around the country. “We need to recognise that the situation in Ferguson speaks to the broader challenges that we face across the nation,” Obama said. Protests erupted in August in the days after Ferguson police officer Darren Wilson shot and killed teenager Michael Brown. Those demonstrations resulted in some vandalism and were met with a violent crackdown by local law enforcement. Wilson has said he shot Brown in self defence, however, some witnesses have said the teenager had his hands up and was running away when he was killed. “First and foremost, we are a nation built on the rule of law and we must accept that this decision was the grand jury’s to make,” said the president. Obama noted some people might agree with the verdict while others would be “disappointed, even angry.” He encouraged anyone upset by the decision to express themselves without violence. “I’m asking anyone who protests to do so peacefully,” Obama said. In his speech, Obama read a statement from Brown’s father that was issued before the verdict. “We should be honouring their wishes,” said Obama. 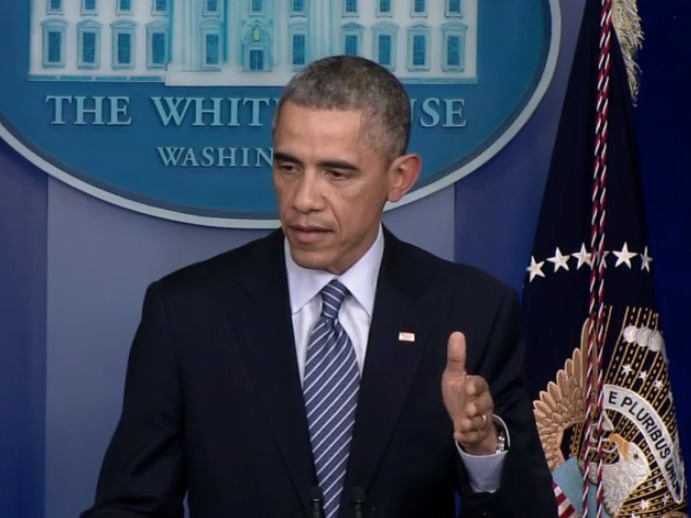 “We need to recognise that this is not just an issue for Ferguson, this is an issue for America,” Obama said. “Communities of colour aren’t just making those problems up,” said the president. Following Brown’s death, the Department of Justice began investigating the police in Ferguson and Attorney General Eric Holder has said “the need for wholesale change in that department is appropriate.” In spite of this, there appears to be little chance that Wilson will face federal charges for the shooting. According to The Washington Post, sources have said the Justice Department did not have a strong enough case to charge Wilson and prove beyond a reasonable doubt that he intended to violate Brown’s constitutional rights. After his remarks Monday evening, Obama was asked by a reporter whether he would consider travelling to Ferguson in the wake of the verdict. “Let’s take a look and see how things are going,” said Obama. This post was last updated at 10:53 p.m.